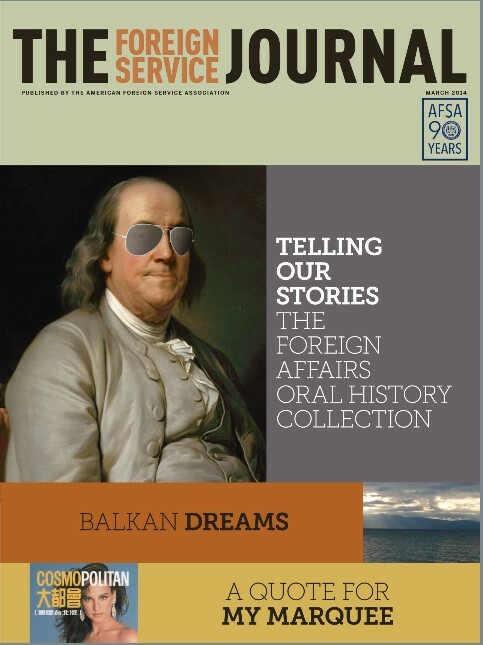 The March issue’s focus is on “Telling Our Stories: The Foreign Affairs Oral History Collection,” spotlighting selections from fascinating interviews with Foreign Service officers that give a window into the challenges, as well as the lighter moments, of a diplomatic career. Managing Editor Susan Brady Maitra has compiled this collection of six stories, one from each decade between 1940 and 2000. These stories truly reflect the importance of having seasoned, qualified diplomats on the ground at all times. In his reflection, A Quote for My Marquee, retired Foreign Service officer Donald M. Bishop shows us that diplomats often face unexpected challenges, for example discussing women’s magazines in China with Helen Gurley Brown. Finally, in the AFSA President’s Views column, Robert J. Silverman offers a provocative piece on social media and its usefulness—or lack thereof—as a diplomatic tool.